If YourWorld101 is the class in session in the School of Life, which books would you choose as required reading? Tell me about the book(s) that changed your life! Spring has sprung my friends. No, really! Don't let the crazy cold snaps fool you. I know the season is upon us, because...... ASPARAGUS. Now that slimy canned mess of my childhood yuck days? No, my friend, the real deal. Farm-fresh, picked the day of purchase, proud little spears that broke through the soil only days before it ended upon my plate. Or salad. Or soup. Or even pizza. WHEREVER. Wherever I can find a place for it. I'll eat bundles of it before the end of its short, sweet season. Do yourself a favor. Pass over the bundled bunch, grown and transported en masse to your local supermarket, likely weeks from its original harvest date. Hunt down, instead, a local farmer, like Willie McKemie, at your local farmers market, and get yourself some field-fresh asparagus STAT. Mr. McKemie of McKemie HomeGrown in Dale, Texas, is the farmer from whom I procured the beautiful batch of purple spears, pictured above, as well as the bright green bunch with which I recently made this Springtime Salad of Asparagus, Strawberry and Radish at the Texas Farmers Markets. Uncooked asparagus will stay fresh for three to four days in the refrigerator. The secret is to keep the vegetable cool and damp. Store spears upright in a container with the stems wading in an inch of water, then cover loosely with a plastic bag. 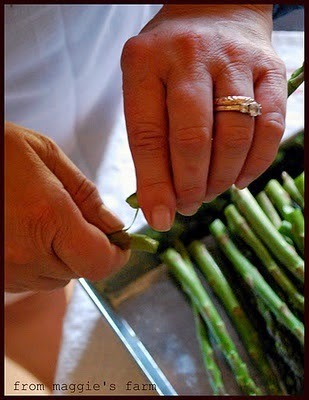 To prepare young, tender asparagus simply trim off the bottom end of the stalk where the green begins to fade. Alternatively, snap off the asparagus ends, as shown. Hold spear firmly and bend it until it breaks naturally. The spear should break at the point where it becomes tough. To prepare larger spears that are tough and woody, simply cut off the tough woody ends. If the spear seems very tough, peel the skin with a asparagus or vegetable peeler. At only 40kcalories per cup, Asparagus is a low-calorie vegetable high in anti-oxidant and anti-inflammatory properties. Enjoy it raw, steamed, grilled, roasted, sauteed, alone with nothing more than a sprinkle of salt and pepper and a squeeze of lemon, or get a little creative with it. The links to recipes, below, share dishes in which asparagus plays a leading role. 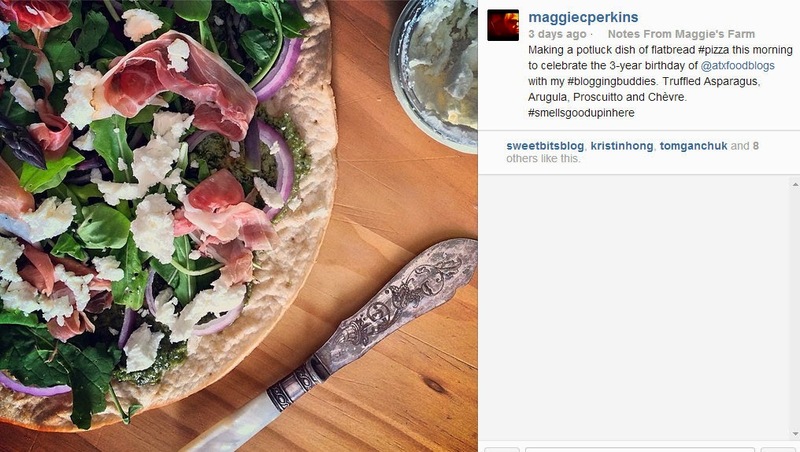 Keep an eye out this Friday for another favorite way to use asparagus, on pizza! 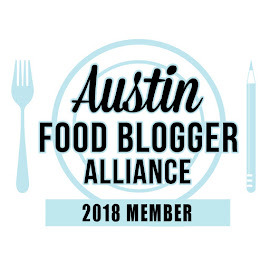 I recently prepared a Truffled Asparagus Flatbread Pizza with arugula, chevre and prosciutto that proved to be a hit at the recent potluck celebration of the Austin Food Blogger Alliance 3-year birthday. I'll be sharing the recipe, along with links to other member dishes that made up our spectacular spread, celebrating food and community. Hey! Join me on Instagram! So what's for lunch today? What you ate last night? Chips and a beefstick from the vending machine? The best looking brown bag in the office fridge (even if it belonged to another)?? The drive thru? I'm not judging. I've had all of the above for lunch (but never another's!). But I've turned over a new (lettuce) leaf. You see, I'm not a morning person. Given my druthers, I'd sleep through most of them. There are those that will argue that I seem to, even if my eyes are open. (To whom it may concern: I KNOW YOU SAY THAT!). Well, anyway, what I was getting at before I was transported by the shame of being a nightowl, was this: Give me a reason to make it through the morning. Give me a cup of coffee, or ten two, give me a nice walk/trot/whatevs with my best guy, Jack. Give me a DECENT LUNCH. It needn't be fancy. It needn't be pricey. It just needs to be somewhat original. Much like this brown bag hack I make in variations, all the time. Not exactly leftovers, I call these combinations of ingredients from earlier meals my Midday Mash-Ups. `and nuts, cheeses, herbs or spices that give the whole thing a little pizazz. Side Note: I like to splurge a little on canned tuna. I pay attention to packaging, harvest practices, quality of meat, and taste. This girl has gotten awfully picky since the days of her favorite pedestrian lunch of cheapest-on-the-shelf-and-with-a-coupon-for-fifty-cents-off tuna, saltines, and Tabasco sauce. ...and drained a can of cannelini beans, rinsed them, let them drain again. In my favorite salad bowl, (or a to-go container with a lid for transport, depending upon my destination that day), I added one half cup of the drained beans to a handful of the prepped asparagus. I grated a small garlic clove, (I often work alone : }. Proceed as appropriate for your workplace with that garlic. ), zested a lemon, liberally ground black pepper over the top, sprinkled a bit of fresh cheese and a few reserved leaves of fresh rosemary. Adjust, delete, or add to the list of ingredients as you prefer. I dressed the salad in a Lemon Rosemary Gorgonzola Vinaigrette. And tossed in a handful of mixed greens. Note: Pack the lettuce separately, to avoid wilting, and add just before eating. This is a high protein, high fiber powerhouse of a meal, and has the oomph to carry you through a very busy afternoon, (in which I might be found furiously making up for being soooo slow to get go, earlier-- did I mention I wasn't a morning person?). So, what is your favorite Midday Mashup? WELL. 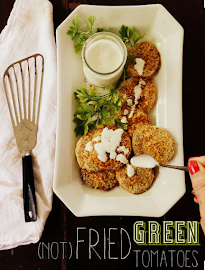 I'm just tickled green to share with you my partnership with Texas Farmers Markets. Along with behind-the-scenes work as marketing coordinator and market-day photographer, I have the honor of being their Guest Chef, monthly. This weekend, I'm on my way to the Cedar Park Market on Saturday, and the Mueller Market, Sunday, where I'll be preparing this Farmers Market Favorite, dressed with Lemon Rosemary Gorgonzola Quick Vinaigrette. Before anyone gets their feathers all a'fluffed, let me say straight away that this is not a proper vinaigrette. It's a quick vinaigrette. Ideal for those days when pulling out the whisk and doing the emulsification a proper vinaigrette requires is just more than one woman can bare Um, bear. WHATEVER! We're BUSY, aren't we folks?! So, consider this quickie solution when there is not one extra minute to spend in the kitchen, and as a quick and delicious way to give your market haul a fancy little suit-up for supper. Fill a half pint jar 2/3 full of your favorite best-quality olive oil. Combine with the zest (Seriously. Zest your lemons, friends.The zest gives that sweet lemony-bright hint that sets this apart from those bottled babies) and juice of 3 lemons (or to taste). Crumble about a tablespoon or so (again, to taste) into jar, and snip the tender leaves (not stem!) of fresh rosemary right into the jar, too. Add kosher salt, and freshly-cracked pepper. How much? To taste, of course. No, really, a good rule of thumb when pulling casual dressings like this together is to salt and pepper the surface of the dressing. You will then cover the jar and shake the dickens out of it. (That's a technical term, somewhere) Then you'll take a little vegetable slice from your salad, give 'er a dip, and taste it. Alternatively, use your finger. Your clean finger. I do it all the time, if I'm just cooking for me. Okay, get a spoon if you have guests. Do remember to store this dressing in the refrigerator. The risk of botulism is greater when additives are added to oil, and kept at room temperature. In terms of food safety, the ideal way to prepare your dressing for the next day's meal, is to run the jar under warm, running water, to soften the olive oil, which solidifies under refrigeration. If you're in the Austin area, please stop by the Cedar Park Farmers Market, this Saturday, from 10am-Noon, and the Mueller Farmers Market this Sunday, from 11-1, to try this in person, and enjoy, with me, these warm and vibrant communities that support, and include our local farmers.